2018 Footlocker Midwest Championships at UW Parkside November 24th. Registration is here https://secure.getmeregistered.com/get_information.php?event_id=130206 You can sign up whenever you would like or I can do a bulk sign-up. Just make sure you list Badger Track Club as your team. 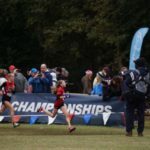 NOTE: The Wisconsin Association Cross Country Championships and the Nationals will be held in Madison Wisconsin next year December 14th, 2019…so this is a GREAT opportunity to get your kid involved and setup to run in an National Championship Event in Madison Wisconsin in 2019! The Badger Track Club will be hosting that meet. 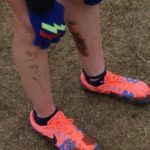 This series will cover an introduction to Cross Country for beginners, as well as advanced training techniques like fartlek, hill, interval and tempo running. This program will prepare them for the WI USATF meet to qualify for the National meet in Reno Nevada on December 8th as well as the Footlocker Midwest Middle School Championship meet. Thanks to WI57 Sports and Rich Reynolds of The Sports News for taking time to Interview coach Scott Brinen. They talked about Badger Track Club and the 2019 USATF Junior Olympic National Cross Country Meet on December 14th at Yahara Hills Golf Course. Check it out! Today is our first day of practice!!! When you get to the Verona track today you can park in any lot you would like. There are several gates that get you onto the track. I recommend parking near the North side of the track near the middle school. We will setup a table for you to check-in, sign our waiver, and make a payment if you haven’t. The table will be on the track or at the entrance. Coach Jennifer will be there to assist you. Your child does NOT have to wait with you, they can come out on the track. We will try to start promptly at 6pm. If you are a few minutes late that’s ok, they can jump right in. 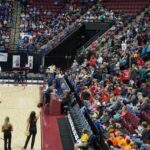 NOTE: It’s always ok if you have to miss a practice or come late, kids can just jump in when they get there or the next practice. I know this model is different than other sports, and I’ve been asked this question many times so I’m communicating it now. We will practice in light rain, cold and wind. We will NOT practice in a downpour or if there is lightning anywhere near us for safety reasons. Please check back here for updates. Because we had late sign-ups I held off on the order until Friday. So I’m hoping we will have shirts by the June 2nd meet. I will update everyone when I get them. We will figure out how to distribute those when we get them. If you have any questions please come find me before practice or after, no question is a stupid question. The google calendar will get updated as we get more information in. Running, Hiking and Yoga can help your physical and mental health! Spring is Upon us, watch your email as we’ll be sending out some group run info as soon as the ground is clear again! This is a great article about how Running, Hiking and Yoga can be very beneficial not only for your physical health but your mental health as well. Don’t forget to take care of both! Don’t worry about what you look like running or how fast you are running, just doing it is what is important. It’s just like anything else, it’s hard at first but as you practice and do it more it gets easier. Running is a sport and exercise that you can do your entire life. Mixing it in with Yoga is even better!! 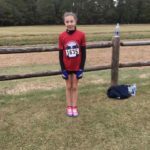 In December I competed at the 2017 USATF Junior Olympic National Cross Country Championship. It was a great experience that Coach Scott from Badger Track Club asked me to share in hopes to inspire more kids to attend in the future. 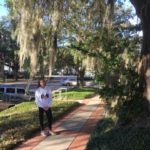 My mom and I flew from Milwaukee, Wisconsin to Tallahassee, Florida on Thursday so that we had plenty of time to find our way around for the next few days. We stayed in a very cool hotel and everywhere we went there were tons of cross-country kids so we weren’t alone. The hotel we stayed at was pretty close to where packet pickup and opening ceremonies were so on Friday my mom and I walked there. It was super cold outside and drizzling and we were wearing everything we brought. When we got in, we followed the signs and my mom grabbed the packet because there were no athletes in the packet pickup room allowed. Again, there were a lot of other people so it was crowded. At the packed pick up place, there was also apparel. The entire weekend, apparel lines were super long both at pick up and at the race. We decided to go on Friday because it was the least busy day of the weekend. After all of that, we took an Uber to the race site. My mom and I didn’t rent a car and we ended up taking Ubers everywhere because it was a lot cheaper and faster than a cab. 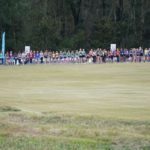 When we got to Apalachee Regional Park, where the race was, the first thing we did was look around for a little bit to find everything and went to the starting line. At the starting line, there was a man with a clipboard who helped us with questions and had a map of the route. (If you were there with a coach, they could probably help with your questions and explaining but I was the only one from my club who attended.) After figuring out the course and where to go during the race, my mom and I walked the entire first lap and worked out what I would do on race day. (Where to speed up, when to pass people before the narrow parts, where it was really muddy, how to start, where to run when it’s really crowded on the turns ect.) This whole time it was really cold and sprinkling and if I were to do it again I would definitely have packed warmer clothes even though I thought it would be warm. After that I warmed up a bit and did the second lap race pace and got a feel for the course when I was running. After we got back to the hotel, we stopped for lunch and then I got my stuff ready for the race. I read the packet and put the chips on my shoes. Later that night, we took an Uber to the opening ceremonies. I really recommend going if you can because it was a really fun experience and there were tons of kids. You sit by region and they explain the race and have different people talk about USA Track and Field. Walking back to the hotel, it was pouring rain. The day of the race we headed out to Apalachee Regional Park and had breakfast on the way. I ran at 1:00 so we left plenty of time to warm up and get into the tent. When we first got there it was really cold so I kept all my layers on and ran the full practice course. Then I did a lot of stretching and my strides with my coat off because I was feeling warmer. 30 minutes before the race they call everyone into a heated tent to wait before going to the starting line. You have to be completely race-ready when you go into the tent so it was chilly. We waited about fifteen minutes in the tent and then went out to the starting line. All 400 girls lined up by region and the starting line was really spread out, so for the most we were about 3 people deep depending on your region. While we were outside there were 3 whistles. 1 was when there was 6 minutes until the race, 1 at 3 minutes and 1 when you should be ready and on the line. The sun had been out almost the whole morning, but when we stepped out it was cloudy and cold so it was really important to stay moving and warm in any way possible. When the race started, about the first 600 meters were super packed and crowded. It was really hard to gain ground because everyone was still going so fast. Eventually, the pace slowed and it spread out a little, running about consistently 3 across for the most part. The course in Tallahassee was really nice but also muddy from all the rain earlier. It was easier than my region’s qualifier because it was flatter, but harder because it was narrow. On the home stretch, it was pretty crowded and in the chute while everyone got their chips taken off their shoes. I had talked to my mom about a place to meet after the race because it was so tight getting out from the chute. The results flashed on the Jumbotron after. I had a personal best by over 50 seconds and my time was 16:35.87. I was very nervous but I am super glad I did it and it ended up being really fun. See some Pictures Below! We are proud to announce that yesterday the Badger Track club won the bid for the 2019 USATF National Junior Olympics Cross Country Championships. The bid was presented and voted upon at the USATF National Meeting in Columbus Ohio. The meet will be held at the Yahara Hills Golf course in Madison Wisconsin on December 14th of 2019. The meet has never been held in Wisconsin and winning the bid yesterday was a historic event not only for the Badger Track Club but the Wisconsin USATF association as well. Special thanks to Jamie Patrick the Vice President of the Madison Area Sports Commission. Jamie and his staff were instrumental in bringing this to Madison. Coach Scott Brinen is working with the Paralympic community and USATF to also bring the first National Paralympic Cross Country meet to Madison Wisconsin to be held immediately after the Junior Olympic National Championships. This is the last chance to sign your child up for the USATF Wisconsin Association Cross Country Meet at UW-Parkside in Kenosha on Sunday November 5th. We currently have 9 members of the club signed up to run. Our boys 13-14 age group currently has 4 athletes and is looking for one more member to make a full team. With 5 runners they would be eligible to qualify as a team for the nationals. If you have a child who is interested in competing please contact me ASAP so we can arrange to get you signed up. Email me at scottbrinen@gmail.com. The weather is supposed to be in the mid 50’s on Sunday so it should be a great day to race!! NOTE: There is an open race as well, you would just need to be a registered USATF athlete to compete. 2017 Footlocker Midwest Championships at UW Parkside November 25th. 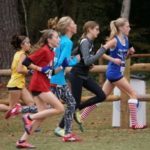 This series will cover an introduction to Cross Country for beginners, as well as advanced training techniques like fartlek, interval and tempo running. Athletes will be put into 2 different groups depending on what level you choose on the sign up form. This will also build a bridge for the indoor track season and the Wisconsin USATF regional in February 2018.